c. The GCF of 14,7, and 42 is 7. 9. a. The GCF of 18 and 6 is 6.
b. The only common factor of 21 and 15 is 3.
gives two terms (x + 3)*4y and (x + 3)*9.
then w + 6 = length of the enlargement. length is 9 + 6 or 15 inches. 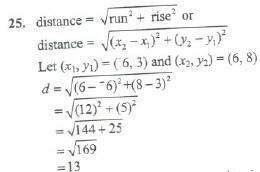 gives the slope and y -intercept. The distance between the two points is 13.